Mirco Bergamasco is the son of Arturo and younger brother of Mauro, both of whom have also represented Italy at international level. Primarily a centre, he made his international debut for the Azzurri as a replacement against France in the 2002 Six Nations having previously worn Italy's colours in a non-cap international. He featured twice more in that year's Championship at centre but was switched to fullback for the end of year clashes with Argentina and Australia. He continued to establish himself in the international ranks under Kiwi coach John Kirwan and featured in all of their 2003 Six Nations matches - including the historic win over Wales - and notched notable tries against England, France and Scotland. Selection for the 2003 Rugby World Cup in Australia followed where he appeared in three of Italy's games as a winger. He remained part of the squad for the 2004 Six Nations, though he only made one start, but the following year he featured in six Tests, lining up in the centre for the last of those appearances against Fiji. Under new coach Pierre Berbizier, Bergamasco was an ever-present in the 2006 Six Nations, scoring tries against Ireland, England and Scotland. Later that year he was on the scoresheet as Italy breezed past Portugal and Russia in their Rugby World Cup qualifiers. With the national side now under the guidance of Bergamasco's former club coach Nick Mallett - the next year was another solid year for Bergamasco. Italy notched two wins in the Six Nations Championship for the first time before progressing to the Rugby World Cup in France where he started three of the pool games. He retained his spot in the line-up for the 2008 Six Nations where he was once again an ever-present. He continued to play a crucial role for the national team and was one of the few players to remain a regular as Mallett chopped and changed his selections, especially in the backline. Possibly his highest international moment came in the 2011 Six Nations when, after missing a couple of simple shots at goal, he found his accuracy with the boot late on as he landed a couple of crucial kicks to help Italy to a historic 22-21 victory over France in their penultimate game of the torunament. Bergamasco began his club career with Petraca Padova in his native Italy but moved to French Top 14 side Stade Francais in 2003 where he played alongside his brother and international colleague Sergio Parisse for seven years. In his time there he has tasted Heineken Cup success in 2005 and Top 14 glory in 2004 and 2007. In 2010 he moved to Racing Metro. Bergamasco was a frequent name on the Italian teamsheet throughout 2010-11 and started all five of their games during the 2011 Six Nations. While he failed to cross the tryline, Bergamasco was Italy's kicker throughout the campaign. 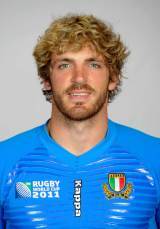 If Italy are to progress in the forthcoming World Cup, Bergamasco will be a key part of Mallett's plans.